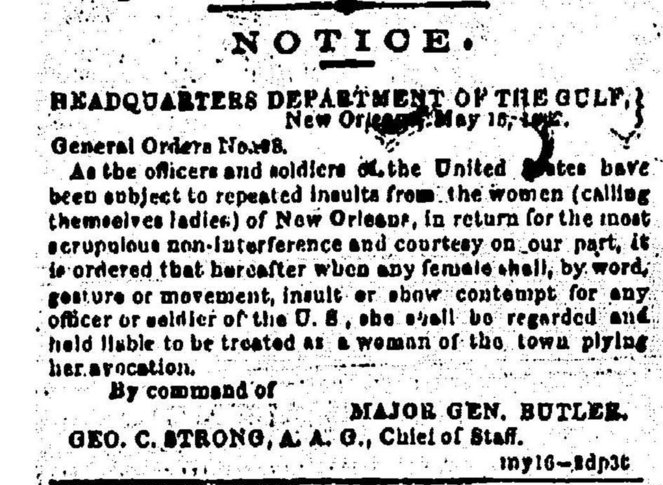 Union General Benjamin Butler's "Women's Order"
From The Daily Picayune, New Orleans, May 16, 1862, page 2. Butler's General Order No. 28 was a decree made by Major General Benjamin Butler during the Civil War. Butler became military commander of New Orleans on May 1, 1862. Many of the city's inhabitants were strongly hostile to the Federal government, and many women in particular expressed this contempt by insulting Union troops. Accordingly, on May 15, Butler issued an order to the effect that any woman insulting or showing contempt for any officer or soldier of the United States should be treated as a woman of the town "plying her avocation" - meaning soliciting of prostitution. Known as the "Woman's Order," it nonetheless was very controversial at home and abroad, as women throughout New Orleans. The general dislike over No. 28 even went so far as people printing his portrait on the bottom of chamber cups and was a cause of Butler's removal from command of New Orleans. The order was highly publicized and heavily criticized both domestically and overseas. Butler became known as “The Beast”. The British House of Lords called it a “most heinous proclamation” and regarded it as “one of the grossest, most brutal, and must unmanly insults to every woman in New Orleans.” The Earl of Carnarvon (now of Downton Abbey fame) proclaimed the imprisonment of women “[a] more intolerable tyranny than any civilized country in our day [has] been subjected to". The London Review criticized Gen. Butler’s rule, accusing him of “gratifying his own revenge” and likening him to an uncivilized dictator. Married in Galviston, Texas in 1908, Max and Elise Scheinuk moved to New Orleans the same year and started the business in New Orleans in 1909. First located at 4433 Dryades Street they opened a shop at 2047 Broadway (corner of Panola) during the mid 1910s and advertised as "The Broadway Florst". 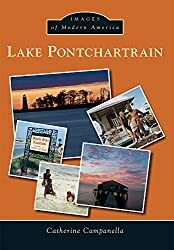 Max had served as an active member of the city Parkway Commission and as a member of the board of directors of the Jewish Children's Home, the Southern Florest Association, and the New Orleans Horticultural Society Floral Association. a native of Poland, he died in New Orleans on May 15, 1974 at the age of 88. Elise, a native of Germany, came to the U.S. in 1906. She passed away on October 11, 1967 at the age of 80. Their business at 2600 St. Charles Avenue also served as their home. Their nursery was on Jefferson Higway near Kenner. Pictured on the right, an October 29, 1954 Times-Picayune advertisement for Scheinuk Florist located at 2600 St. Charles Avenue. 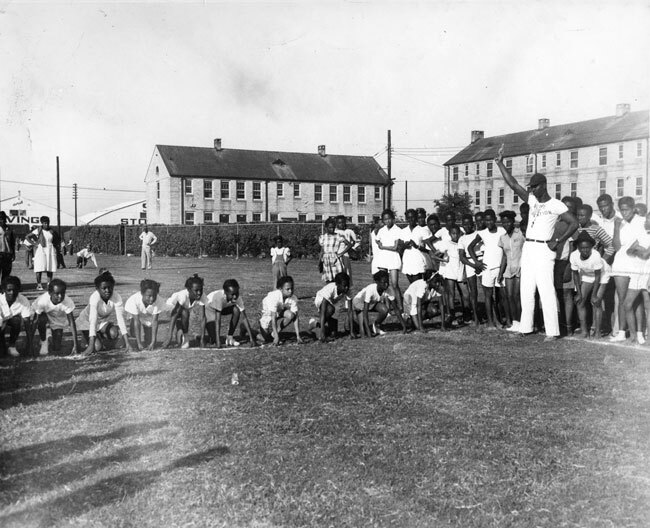 The designated route of Interstate 10 through New Orleans called for it to run along North Claiborne Ave. On Nov. 14, 1961, city officials met on the avenue's neutral ground at Dumaine St. to mark its oak trees that were to be "saved." They are, from left, Herman Farley, president of Parks and Parkway Commission; Wilson S. Callender of New Orleans Floral Trail; Mayor Victor Schiro; Felix Seeger, commission superintendent, and Max Scheinuck, chairman of the ground committee. Only 51 of the 253 trees from Canal St. to Elysian Fields Avenue were deemed salvageable in a move The Times-Picayune editorialized was "indispensable to general progress." Removal of the trees did not occur until February 1966. Many cite the destruction of this leafy boulevard and its vibrant community life as start of Treme's downward spiral. Removal of this stretch of the interstate has been suggested in several post-Hurricane Katrina plans. On May 15, 1944, the Liberty ship Alexander W. Doniphan was launched by Delta Shipbuilding Company. A formal portrait of Archbishop Joseph Francis Rummel, taken by local photographer C. Bennette Moore sometime between the Archbishop's installation (May 15, 1935) and Moore's death (December 8, 1939). On May 15, 1847, in honor of victories in Mexico, the entire city was illuminated. At the May 9, 1832 Conseil de Ville session, the body "RESOLVED, that the Mayor is and remains authorized to use the stores necessary to complete the sidewalks "City Carre' Banquettes" already begun at the ???? intersections. The paving material left over and that which shall hereafter be had from this should be exclusively used to pave Royal Street". This was approved on May 15, 1832 by Mayor Prieur.